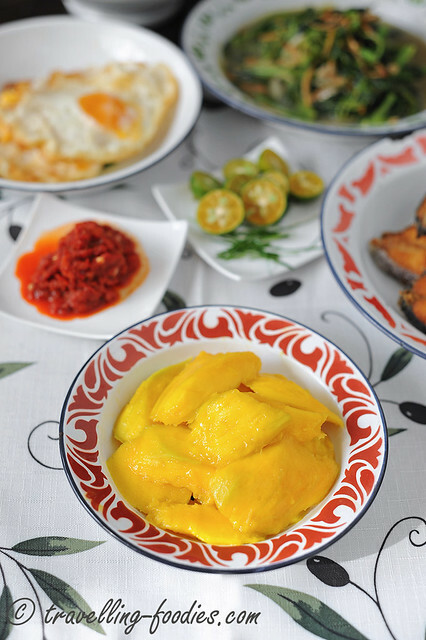 The Peranakans have a strong affinity for tropical fruits and would feast on them whenever they are available. Apart from the run-in-the-mill bananas, durians and jackfruit, a simple offering of more seasonal ones like buah duku, buah langsat, buah pulasan can please a baba to no ends. And those who truly enjoy the exotics would turn to the elusive, like buah kedondong and buah rambei. 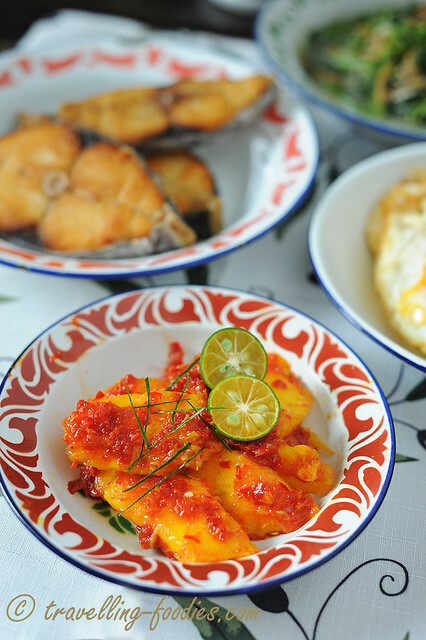 Some fruits can only be properly enjoyed when prepared into a dish, like buah sukun or in the case of buah binjai and buah kuini, incorporated into sambal belacan to be a relish which is thoroughly enjoyed with fried fish! I was walking along the aisles of a local supermarket which a familiar aroma beckoned me to check it out. Lo and behold, a fresh batch of buah kuini has just arrived from Malaysia that very morning. At SGD 4.80 per kilo, it is hardly considered cheap. But looking at how good their condition is, the invitation to bring some home is far too tempting. After choosing 5 plump and firm ones, I’d to pull myself away from the lot before the “damage” escalates. Moreoever, the quality of this batch is yet to be known. Sweet or sour they would turn out to be, only one way to find out. Choosing buah kuini is pretty much the same as with buah binjai. For buah kuini especially, it is really a matter of experience to tell when they are ready to be eaten. The sap of unriped ones are toxic while the chemical composition of esters and phenols within the fruits begins to change drastically when they ripen too much, leaving quite a nasty aftertaste. 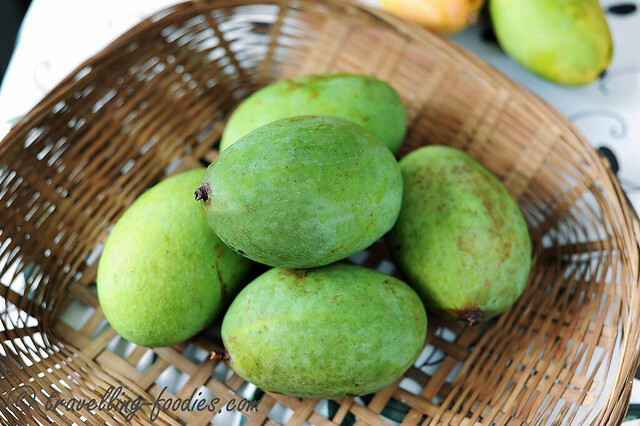 Unlike regular mangoes, buah kuini are best when they are still firm. When the fruits are just beginning to soften, they are already too ripe for proper consumption. So a simple tip is just to choose the largest fruits one can find which are still firm to touch. Avoid those which may dent when a slight pressure is applied. Those are already no good to go. And just like Harumanis, the ripen fruits are still green on the skin. So once I’d laid my hands on some good buah kuini, making a sambal out of them is the next thing to do! Pound or blend the red chilies, chili padi, shallots, belacan powder, sugar and lime juice until a coarse paste is produced. I prefer not to pound the ingredients too finely for more textural contrast. Taste and adjust with salt and/or more lime juice, depending on the level of sweetness of the buah kuini, as well as the quality of the belacan powder used. On a plate, place sliced buah kuini and drizzle the sambal belacan paste over it. Garnish with julienned kaffir lime leaf and more calamansi lime halves. 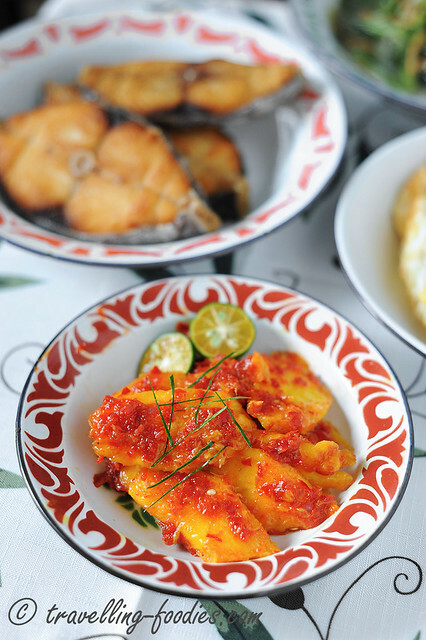 To enjoy, use the back of a fork to mash the buah kuini slices slightly and mix well with sambal belacan paste. 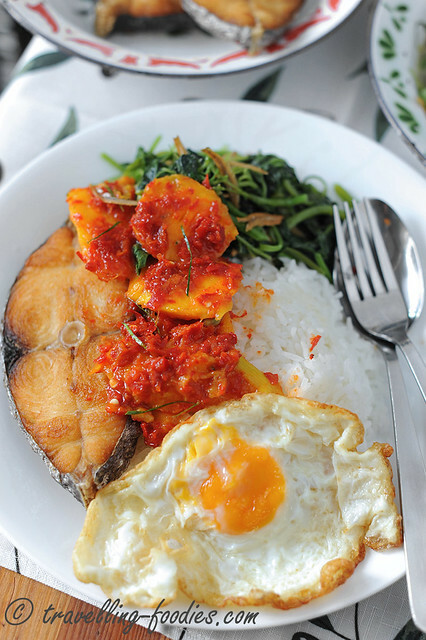 Serve with fried fish like black pomfret (ikan bawal hitam), or mackerel varieties like ikan tenggiri or ikan batang. This entry was posted on May 15, 2014 by Alan (travellingfoodies). It was filed under Food, Simple Eats and was tagged with bawang merah, belacan, buah kuini, calamansi lime, fermented shrimp paste, kaffir lime leaves, limau katsuri, mango, sambal belacan, Sambal Buah Kuini, shallots. hi! i heard of buah kuini but never eaten it before until recently, a friend gave me 3 pieces of kuinis. i dont know what to do with it. I found your recipe and tried it…OMG!! it taste great!! thanks Alan..